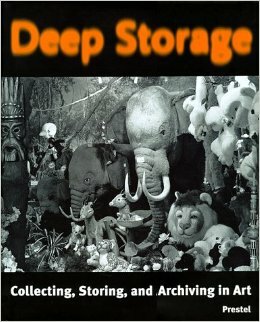 Deep Storage: Collecting, Storing, and Archiving in Art, edited by Ingrid Schaffner and Matthais Winzen, was published in 1998 in conjunction with the exhibition of the same name at MoMA PS1 and the Henry Art Gallery in Seattle. While storage and archiving remain practical and logistical issues for contemporary art collections, this book addresses how these acts became part of artistic practice in the twentieth century. Shaffner and Winzen compile a number of brief entries, organised alphabetically by artist or theme, giving the book the appearance of an archival index. In these entries, twenty-five authors write about more than forty artists and topics including ‘cyberspace,’ ‘Rauschenberg,’ and ‘Warhol’ to illustrate how acts of collecting and storing have become artistic processes and endeavours, more than means to preserve traditional artworks. These examples range from material collecting to digital storage and electronic media. Each example encourages the reconsideration of what constitutes art and artistic practice in a contemporary context. What does it mean to bring works of art together in a collection? What is distinctive about this or that collection? How, and indeed why, should contemporary art be collected? Museum curators, private collectors, even artists themselves, are constantly re-visiting these essential questions. Such deliberations usually happen behind the scenes, but this website brings them to the fore, drawing on interviews with curators working around the country, discussions with professionals and individuals immersed in collecting, and a survey of current research and further reading. The Public Collections section encompasses all those institutions that have actively acquired contemporary art since 2000 in Scotland, and includes detailed profiles of their collecting policies, as well as case studies of key works of art they have acquired. The Private Collections section is particularly concerned with private collections that have sought a public platform (this section will be developed later). Enabling Collecting is a varied section, looking at how acquisitions are financed, how curatorial development and research is supported, and what obligations and challenges there might be for the conservators of contemporary art. In particular this section profiles certain nationwide strategies for supporting collecting that have been launched since 2000. Futurecollection is a space for more speculative writing that imagines various futures for collecting and collections. The Reading Room provides reading recommendations and a portal to further research and resources in this area. As a lecturer, researcher, and consultant working in the field of visual art, Kirstie has conducted conversations around contemporary art with artists, professionals, students and general audiences since 2000. In 2007 she filmed interviews with the collections curators participating in Scotland’s National Collecting Scheme for Scotland. A further series of consultations with Scotland’s visual art sector in 2010 enabled her to form Outset Scotland, a philanthropic fund that works with private individuals to support contemporary art commissions and the gifting of new works to museum collections. In 2014, funded by Glasgow University’s Affiliate Programme, she embarked on an intensive series of dialogues for this website; and at the same time, began working with Edinburgh University’s Curatorial Fellow Kirsten Lloyd, to enable Masters students to engage with, and contribute to, this fascinating field of research.